General Ecology - Welcome to The Frog Pad! Ecology is the study of the relationships between living organisms, including humans, and their physical environment; it seeks to understand the vital connections between plants and animals and the world around them. Ecology also provides information about the benefits of ecosystems and how we can use Earth's resources in ways that leave the environment healthy for future generations. Ecologists study interactions at multiple levels. Some ecologists focus on how individual organisms respond to their environment. Other ecologists are more interested in how organisms of the same species interact with each other in populations. Still others spend their days examining how whole populations interact with other populations in a community. 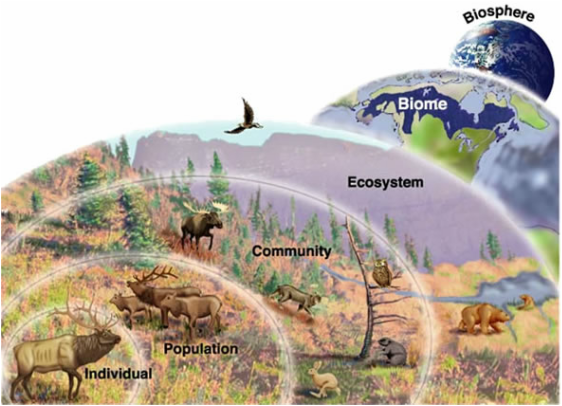 And, at a higher level, some ecologists focus on the big picture, studying the interactions between all of the living and nonliving elements in a given area, or ecosystem. Ecosystems maintain themselves by cycling energy and nutrients obtained from external sources. A food web consists of all the food chains in a single ecosystem. Each living thing in an ecosystem is part of multiple food chains. Each food chain is one possible path that energy and nutrients may take as they move through the ecosystem. All of the interconnected and overlapping food chains in an ecosystem make up a food web. Organisms in food webs are grouped into categories called trophic levels. Roughly speaking, these levels are divided into producers (first trophic level), consumers, and decomposers (last trophic level). Producers make up the first trophic level. Producers, also known as autotrophs, make their own food and do not depend on any other organism for nutrition. Most autotrophs use a process called photosynthesis to create food (a nutrient called glucose) from sunlight, carbon dioxide, and water. Plants are the most familiar type of autotroph, but there are many other kinds. Algae, whose larger forms are known as seaweed, are autotrophic. Phytoplankton, tiny organisms that live in the ocean, are also autotrophs. Some types of bacteria are autotrophs. For example, bacteria living in active volcanoes use sulfur, not carbon dioxide, to produce their own food. This process is called chemosynthesis. The next trophic levels are made up of animals that eat producers. These organisms are called consumers or ﻿heterotrophs﻿. The amount of energy at each trophic level decreases as it moves through an ecosystem. As little as 10 percent of the energy at any trophic level is transferred to the next level; the rest is used by the organism to stay alive and much of it is lost largely as heat. The planet functions under the law of conservation of matter, which basically says that matter on Earth cannot be created or destroyed, but only transferred. Therefore, the planet's biogeochemical cycles are the mechanisms that cause the transfer of matter. 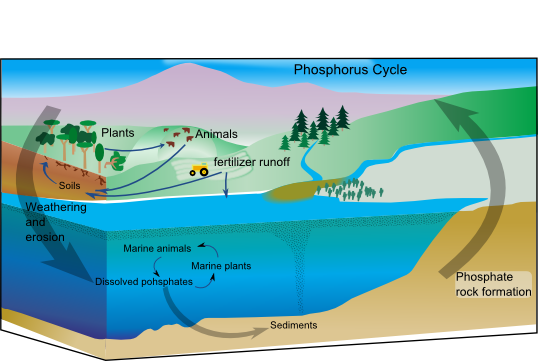 There are four cycles that are important in biology: water (AKA hydrologic - see diagram at right), carbon, nitrogen and phosphorus. Carbon (C) is the basis of life on Earth. Scientists consider 99.9% of all organisms on the planet to be carbon based life. Those organisms need carbon to survive. Whether the carbon is in the form of a sugar or carbon dioxide gas, we all need it. Unlike energy, carbon is continuously cycled and reused. The Earth only has a fixed amount of carbon. Nitrogen (N) is an essential component of DNA, RNA, and proteins, the building blocks of life. All organisms require nitrogen to live and grow. Although the majority of the air we breathe is N2, most of the nitrogen in the atmosphere is unavailable for use by organisms. This is because the strong triple bond between the N atoms in N2 molecules makes it relatively inert, or unreactive, whereas organisms need reactive nitrogen to be able to incorporate it into cells. In order for plants and animals to be able to use nitrogen, N2 gas must first be converted to more a chemically available form such as ammonium (NH4+), nitrate (NO3-), or organic nitrogen (e.g., urea, which has the formula (NH2)2CO). The inert nature of N2 means that biologically available nitrogen is often in short supply in natural ecosystems, limiting plant growth. View this animation about the Nitrogen cycle. Quiz yourself with these online ecology quizzes by Bioman. Enjoy these National Geographic photographs!